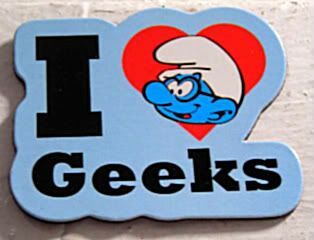 Here we go with another Smurfy magnet from Target, this one with one of my favorite Smurfs of all, Brainy Smurf. I needed a little reminder of what qualifies anyone as a geek. Though, I suppose MW should update their listing a little more toward Urban Dictionary's entries. In the past 24 hours, I've seen folks like @NathanFillion and @Alyssa_Milano, and @ZacharyLevi refer to themselves as geeks. And of course, every time I hear a David Tennant interview, he tends to self-deprecate his Doctor Who and music fanboy behaviors as less than cool. They're certainly not the only ones around, they're just the ones I've noticed recently. Eh, I just think it's funny how most people tend to dismiss themselves as geeks, whether or not people believe them or not. As for myself, I tend to wear the term proudly - I mean, after all, you're sitting on 690 magnets' worth of geekiness. Now, excuse me, I need to go find a live chicken. And maybe a carnival. Hey - IIRC, that's how we "met," your posting on dorkiness - (and whether or not you should be watching DW). Do you know the way to La-la Land?